Amanda began working at Camp Canine as a front desk receptionist in Janurary, 2015 and was promoted to Reservations Specialist a few months later. You may have talked to her on the phone once or twice (or a hundred times); it was her job to welcome new clients and introduce them to all Camp Canine has to offer, as well as make reservations for existing clients. It was not long before the Camp Canine family learned that she is an extremely talented artist. As a result, she now works as Camp’s social media manager and artist in residence. You can see her murals today. She has painted murals (one of them spanning 16 feet long!) in the Fetch Room, the Tiny and Small Dog Room and the vestibule outside out front door. 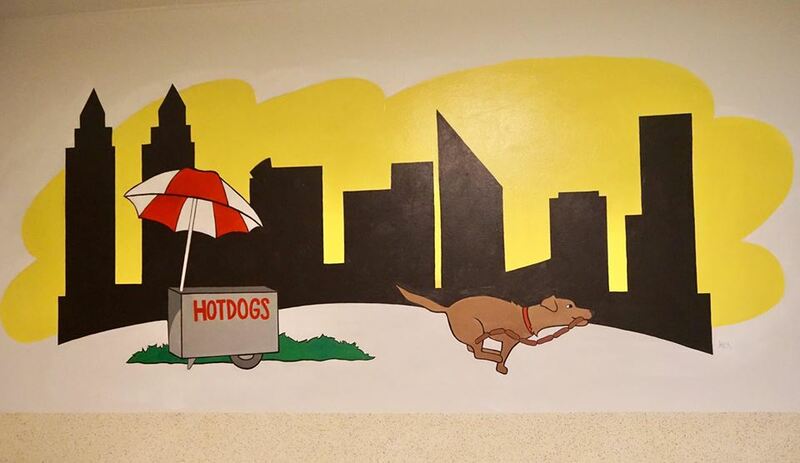 Currently, she is working on murals in the Grooming Room, the Cat Room, and – who knows – maybe a few more places. Amanda begins the process with a digital sketch. 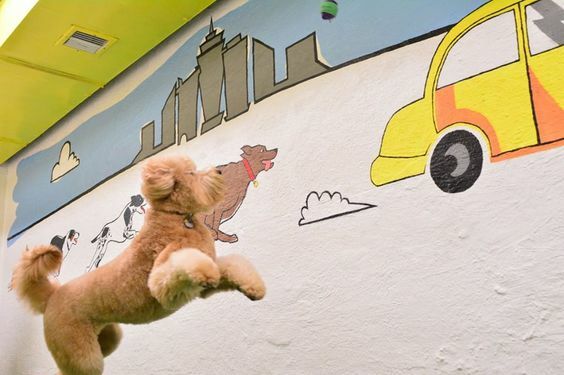 Once approved by management, she primes the walls and then lightly draws her mural. she’ll get the sketches approved and, after the walls are primed, she’ll lightly draw her mural onto the wall with pencil. Finally, she’ll begin painting. And she will spend 8 hours a day with that acrylic paint! 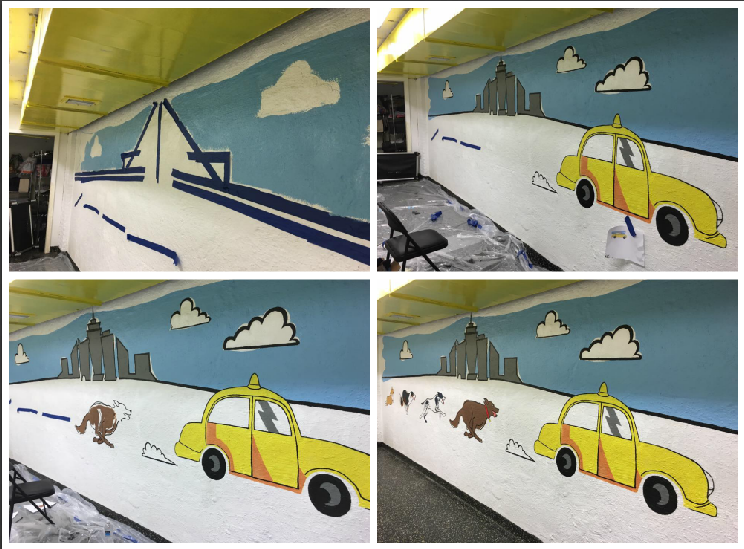 Each mural takes around 3-4 days. Digital mockup of the mural that will be going in the cat room. Amanda has done commissioned work for a few of Camp Canine’s affiliates: pet portraits for clients, memorials for dogs that had passed away, and donations to fund-raising events for a few of the rescues that Camp Canine partners with. In fact, she is always available for commission work! Beyond that, she has begun showing her work. Her first show was a solo exhibition at the Upright Citizens Brigade in the Lower East Side. Next, she’ll be showing at the largest international arts show in the United States, Art Prize. She hopes to add more shows to her resume. She loves whimsy and color, and is inspired by “all that is good in life” (cotton candy, pandas, fireworks, etc.) If you are interested in contacting Amanda, email amandabeararts@gmail.com. If you would like to take a closer look at her work, check out amandabeararts.com. 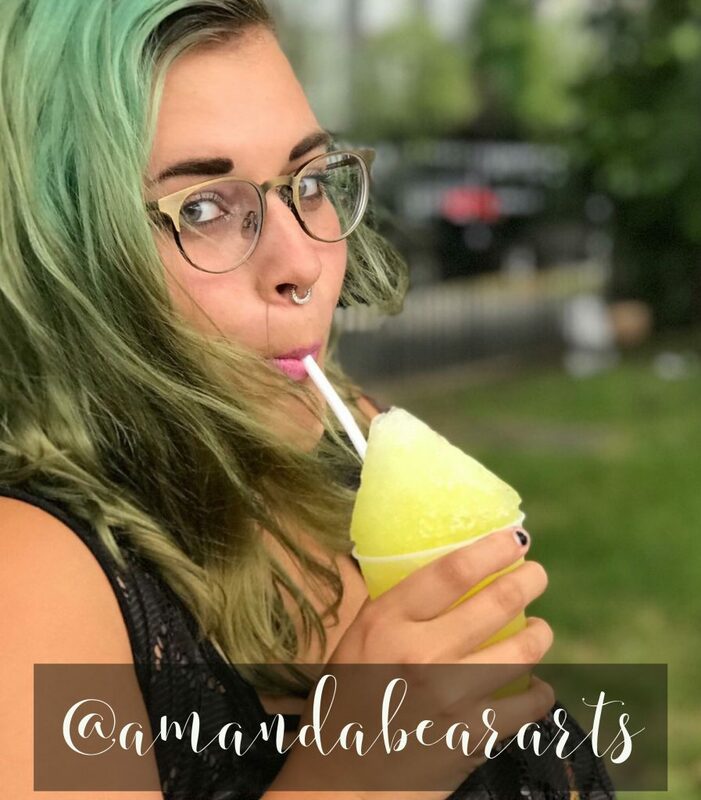 And if you would like to follow her on Instagram, do so at @amandabeararts.